Laura Gardin Fraser (1889 - 1966) was born near Chicago Illinois. She was encouraged in art by her mother and by the time she graduated from high school in New York City she had already modeled two portraits and many animal sculptures. She enrolled in the Art Students League winning the Saint-Gaudens Medal in her first year, a scholarship in her second year, and the Saint-Gaudens Figure Prize in her last term. She became an instructor at the League between 1910 and 1913, working under James Earl Fraser who was her sculpture instructor at the school. Laura Gardin and James Earl Fraser were married in 1913 and purchased a home in Westport , Connecticut where they built a large studio for them both to sculpt in. 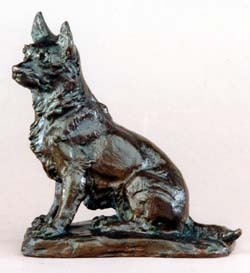 Laura's career in sculpture started with creating Medals, coins, fountains, and animals for which she is very well known. She was the first woman to design a Coin for the United States Treasury and was commissioned to do several monuments including the double equestrian statue of Robert E Lee and Stonewall Jackson in Wyman Park, Baltimore, Md, the three relief panels at the entrance to the library at West Point, and a white granite figure of Pegasus at Brook Green Gardens, South Carolina. Laura Fraser won many honors during her career as a sculptress and even though she was a great artist she constantly had to overcome being seen in the shadow of her famous husband. The only project that husband and wife collaborated on was the Oregon Trail Memorial Half Dollar. All of her own works were done solely by herself with just the encouragement of her husband. They lived their entire lives at their Westport home working constantly in their studio. She was a member of The National Sculpture Society and The National Academy of Design. Among the awards and honors won by Laura Gardin Fraser are: The National Arts Club Medal of Honor (1915), the Julia L. Shaw Prize (1919), the Saltus Gold Medal of the National Academy of Design (1924 & 1927), the Ager Prize of the National Association of Women Painters and Sculptors (1929), and the Watrous Gold Medal of the National Academy of Design (1931). An entire building at the Cowboy Museum of Western Art in Oklahoma City is devoted to the plaster models and personal effects of James and Laura Fraser.